Cedars of Lebanon, trained by Patrick Prendergast, winning the Foran Equine Irish EBF Auction Series race at Naas on 30th September. Twenty seven horses remain after today’s final forfeit stage for the Foran Equine Irish EBF Auction Series Final, including seven series race winners. Trainer Ger Lyons has four runners with Kestrel Prince being the horse with the highest official rating (89) but his Army Recruit was runner up to the smart Circus Maximus at Gowran Park last time and that form was well boosted by the subsequent third placing of Circus Maximus in a Group 3 event at Newmarket. Michael O’Callaghan has two remaining with the once raced Dark Pursuit likely to be the pick of the duo having defeated Army Recruit in good style at Down Royal on his only start. Trainer Joseph Murphy has really hit form in the last month, his Gustavus Weston was an impressive winner of his latest start at Fairyhouse last month. Top National Hunt trainer Gordon Elliott also has two to choose from with his Galway Festival winner Highway To Success likely to go well but his other representative Aristocratic Man chased home the subsequent Beresford Stakes winner Japan on his most recent start at Listowel. Last year’s winning stable, Dermot Weld, is likely to be represented by Munees Gemini, runner up to the well-regarded Goddess on her first start at Leopardstown in July. 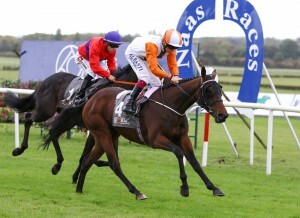 Commenting during the week, Jessica Harrington said; “Dragon Roll is our main contender, she won a Foran EBF Maiden at Gowran Park, she just got up on the line, there was a little bit of an ease in the ground that day, I would be hoping that we could have an ease in the ground on Sunday. It’s a great series, I am really for it, I think its brilliant, it does give people with a smaller budget the chance to win a race and go for the big pot in the final. Bought as a yearling by Charlie Gordon-Watson for 300,000gns at Book 1 of the Tattersalls October Yearling Sales, POET’S WORD carried the colours of his owner Saeed Suhail to win seven of his 17 starts – four of which came at Group level – amassing career earnings of £2,951,329. POET’S WORD is one of five winners out of the NASHWAN mare WHIRLY BIRD – a multiple winner and Listed-placed – making him a half-brother to four winners, headed by Group 3-winning juvenile MALABAR (RAVEN’S PASS), who was also a Group 3 scorer at three, and dual scorer WHIRLY DANCER, dam of high-class two-year-old BECKFORD. Record-breaking Gr.2 Coventry Stakes hero Rajasinghe has been retired to stand at The National Stud in Newmarket. Rajasinghe showed an exceptional turn of foot when breaking the track record and running the fastest ever recorded time for a two-year-old over six furlongs at Royal Ascot, beating subsequent Classic winner Romanised and Gr.1 winner US Navy Flag. He followed up that run with another top performance when finishing third in the Gr.2 July Stakes at Newmarket. “His win at Royal Ascot last year helped put us on the map. It was a very special day and a fantastic performance to beat the track record. Rajasinghe is a son of Choisir, who has produced 11 Gr.1 winners to date including Starspangledbanner who has made an immediate impact at stud, most notably when siring Gr.1 winner The Wow Signal. “We’re hugely excited to stand Rajasinghe at the National Stud in Newmarket. His record speaks for itself, he’s a Gr.2-winning son of Choisir who broke the track record at Royal Ascot when winning the Coventry Stakes. Rajasinghe will be managed by the Avenue Bloodstock team of John Ferguson, Mark McStay and Amy Lanigan. He will stand at a fee of £5,000 Oct 1, SLF. Lifetime breeding rights will also be sold. Lancaster Bomber, the G1-winning son of War Front who was famous for his extravagant front-running style, has been retired to the National Stud in Newmarket. 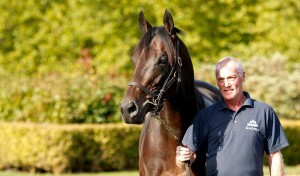 He will be managed by the Avenue Bloodstock team of John Ferguson, Mark McStay and Amy Lanigan. Lancaster Bomber will stand at a fee of £8,500 Oct 1, SLF. Lifetime breeding rights will also be sold. The winner of his maiden in August at two, Lancaster Bomber went on to be runner-up in the Dewhurst, two Breeders’ Cups, and the fastest-ever running of the St James’s Palace Stakes, before his G1 victory at the Curragh in the Tattersalls Gold Cup took his earnings well over the million-pound mark. His battling second-place finish behind Churchill at Newmarket at two – fending off Blue Point and Thunder Snow – came in a time faster than 39 of the Dewhurst’s runnings as a G1 contest – while his run in the G1 St James’s Palace Stakes came in a time fast enough to have won all the other 184 runnings of the Royal Ascot showpiece. He was also a close-up fourth in the 2,000 Guineas. Among the others he defeated were Churchill, Ribchester and Limato. Lancaster Bomber’s race record stands comparison with that of his sire, War Front, a G2 winner at four who was runner-up in five more Graded Stakes, two of them G1s. War Front, who retired to stud at $12,500, has gone on to become one of the world’s most prepotent stallions of the day, now commanding a fee of $250,000. He is America’s leading auction sire with a 2018 yearling average of $783,000 and his offspring have won the Middle Park and Cheveley Park Stakes, three of the past five Dewhursts, the July Cup, the Queen Anne and the Juddmonte International. 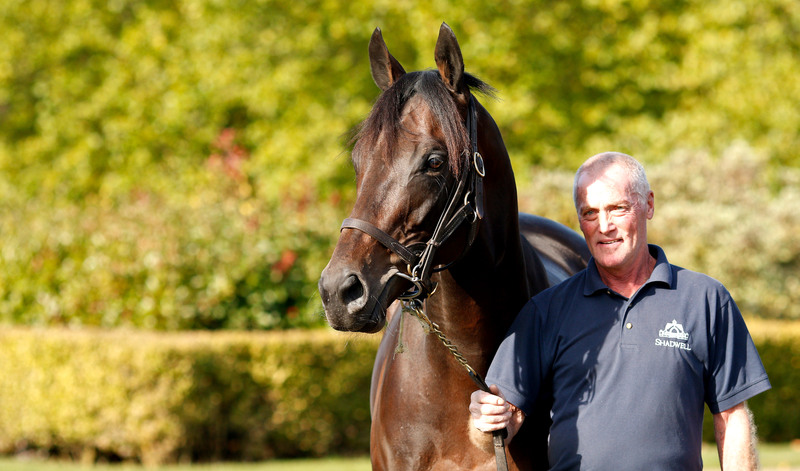 War Front’s first European-raced stallion son, Declaration Of War, has sired the French 2,000 Guineas winner in his debut crop. Lancaster Bomber, whose pedigree is free of Danehill and Sadler’s Wells, is out of the excellent Indian Ridge mare Sun Shower, also dam of Barney Roy’s sire Excelebration. This is the deep Ardenode family of Irish Classic winners Sarah Siddons, Princess Pati and Ragusa.